replace.exe is a legitimate file. This process is known as Replace MFC Application. It belongs to Replace Application software that was developed by Casady & Greene. It is commonly stored in C:\Program Files. Malware programmers or cybercriminals write different types of malicious programs and name it as replace.exe to spread virus. How to check if your computer is infected with replace.exe malware? If the file is located outside C:\Windows\System32, then it is likely that the system is affected with replace.exemalware. How to remove replace.exe malware from system using Comodo Antivirus? 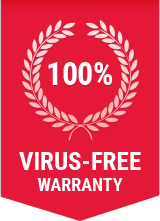 Step 1: Download the award-winning Comodo Free Antivirus. Step 4: Once the Installation is Finished, restart your PC. Step 5: It will take some time for the Comodo Internet Security to update the antivirus. Step 6: Proceed with a quick scan that automatically begins after the update. Step 7: If threats are found during the scanning, you will be prompted with an alert screen. Step 8: Comodo Antivirus will remove replace.exe malware from your computer including all other malwares!